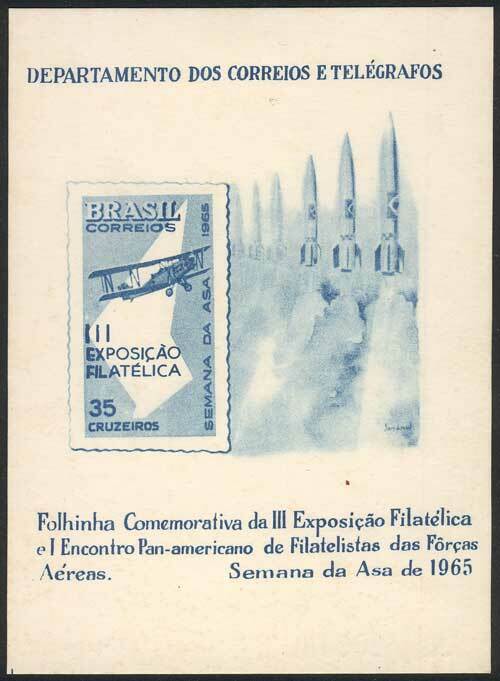 Sc.1012, 1965 Philatelic exposition, Air Force (airplanes, rockets), special impression on a commemorative card (folhinha), VF! Lot 501 - brazil souvenir sheets - Guillermo Jalil - Philatino Auction # 1911 WORLDWIDE + ARGENTINA: General March auction! Lot 528 - brazil postal history - Guillermo Jalil - Philatino Auction # 1911 WORLDWIDE + ARGENTINA: General March auction! Lot 539 - brazil cinderellas - Guillermo Jalil - Philatino Auction # 1911 WORLDWIDE + ARGENTINA: General March auction! Lot 432 - brazil general issues - Guillermo Jalil - Philatino Auction # 1911 WORLDWIDE + ARGENTINA: General March auction! Lot 278 - Argentina general issues - Guillermo Jalil - Philatino Auction # 1916 ARGENTINA: "Budget" auction with many good lots at VERY LOW STARTS! Lot 289 - Argentina general issues - Guillermo Jalil - Philatino Auction # 1916 ARGENTINA: "Budget" auction with many good lots at VERY LOW STARTS!